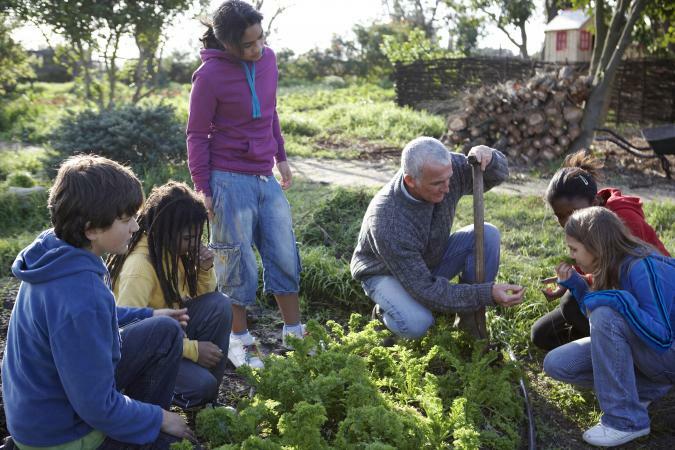 Gardening is a popular hobby in the United States and schools are getting their hands dirty by hosting school gardens. Growing food and ornamentals is fun, rewarding, and relaxing, as well as educational. Once you've been approved to plant a garden, you should select the best location. Choose an area that receives at least half of a day's sunlight - about 6 hours. In northern areas (zones 5-1) you will want to orient the site for a full day's sun. Those schools in arid or tropical zones will be sowing in the fall and winter. Don't situate the garden in flood areas, near the road, or in areas that are "microclimates" such as hollows that retain cold or paved stretches that bake with heat. Be sure the area is within easy access to a water source. If this is not possible, you can get large containers that are safe for holding volumes of water intended for gardening. Set out tubs and containers to catch rainfall. This technique reminds students to conserve water and other natural resources while they are growing. It's all about the dirt. A proper planting medium needs to be balanced. Do not till the garden as this disturbs the soil's balance. In the resting season, when the garden sits fallow, use a mulch cover of leaves or straw (do not use hay since the seeds will sprout grass). Add organic fertilizers and minerals just before planting. Lime takes 6 months to become active, so plan on setting it down well before it's action is needed by the plants. Compost is also added in the fall or fallow months. At the end of your first growing season, collect soil samples and send them out to your local agricultural extension office that conducts soil testing. You don't need great dirt or perfect ground to place your plot. Simply construct a raised bed and have clean growing soil brought in. Raised beds can be as simple as hilling up dirt to setting up architecturally designed wood frames. Never use railroad ties or lumber with old paint or unknown preservatives. These may contain toxic substances and heavy metals. Children will use the garden as a real-time classroom. Grow plants that are linked to world cultures, are unusual or intriguing, and that are likely to do well in your area. Cherry tomatoes, yellow squash, shell and pole/bush beans, melons, and peppers (hot or sweet) are good options. Try to choose varieties that are heritage, endangered, unique or part of a local culture. If the garden will receive sun and shade in different sections, exploit the opportunity. Grow shade crops like lettuce and radish, while saving the sunlit patches for okra, eggplant, peppers and tomatoes. Select appropriate flowers for your zone or ones that will bloom in the spring so kids get a chance to see them before the school year ends. Use symbiotic planting. Marigolds dispel bean beetles, basil assists tomatoes, and the "three sisters" is a classic Native American method that allows squash to crowd out weeds, while beans climb up the cornstalks. Add some basic herbs to your garden, like cilantro. Sow some sensational species. Grow tropicals like limes or lemons (even bananas) and pop in some spectacular ornamentals like sunflowers or Jerusalem artichokes. Edible berries are a must, but don't neglect "cool" crops like stevia or goji berries. Once your garden is up and running, don't plant the same species in the same spot each year. For example, plant corn for one season and switch to beans the next. The beans set nitrogen (like all legumes) and corn is a "heavy feeder" crop. Children become engaged and excited by hands-on learning. 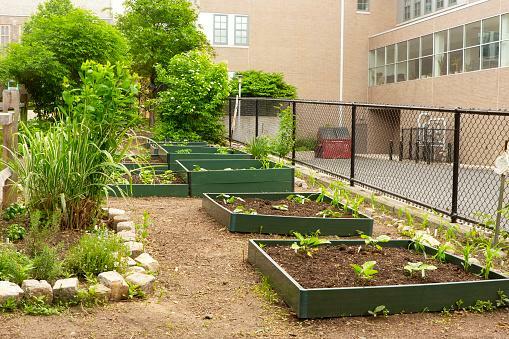 The garden is a school "community" project and everyone engages in fostering its growth. Delegate activities from planting to harvest by age so kids get the most out of their experience. The smallest kids can start with simple tasks like planting seeds while older elementary students can do more of the difficult weeding. Young students will be able to break ground, literally. Small trowels are perfect for small hands. 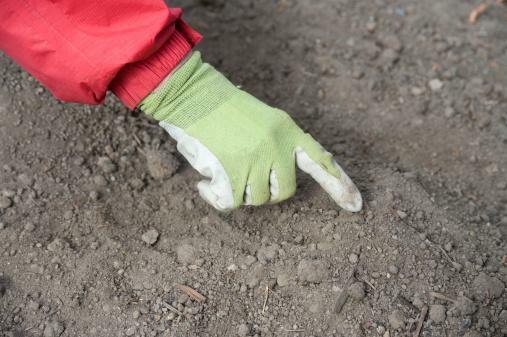 Children can break up sections of dirt and get the area ready for seeds or plants. The tussled soil makes it easier for the seeds or plants to set down roots. Planting seeds is easy, whether you're planting vegetables or planting flowers. Show younger groups how to mark out the row for the seeds by pressing lengths of cedar or bamboo tomato stakes across the loose dirt. This creates an instant row. Seeds are placed in the straight furrow and covered over with soil. Water the planting well to get it off to a good start. Beans and corn should be soaked to soften the outer layer. Germination is faster and easier for the seedling without having to fight through the protective hull. Have the children place the seeds in a bowl filled with room temperature water. Usually 6-8 hours is enough to get the seeds ready for planting. Small hands are just the right size for weeding and thinning. Crops such as lettuce or carrots need to be thinned to prevent crowding and poor crop size. The pulled carrots can be fed to pets - and the lettuce makes for a gourmet lunchroom salad (microgreens). Older students will get be able to do more physical care and difficult tasks. 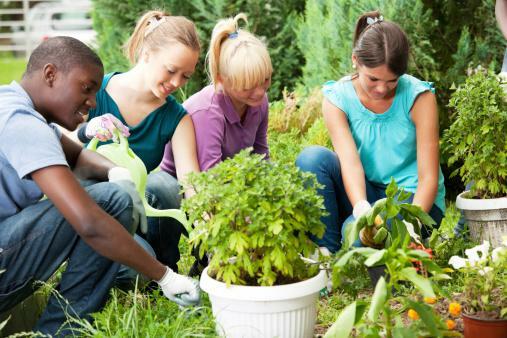 Difficult tasks, such as turning compost, are great for older students. Composting requires strength and handling heavy, sharp tools. 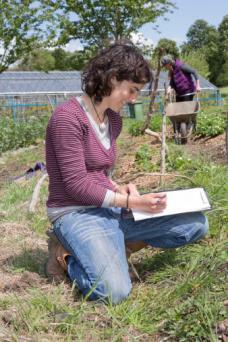 Organic fertilizer and pest control applications are jobs for more mature students. Dealing with and troubleshooting growing issues are also tasks best suited to advanced classes. For example, tomato blossom end rot can be detected quickly (round, brown spot under the growing fruit) and treated with a calcium/magnesium supplement. Have older students keep a checklist of what grew well, what didn't, and how to amend the soil or head off trouble in next year's crops. All age groups will want to harvest the fruits and vegetables and pick flowers for display or sale. When the corn is ripe (check for brown tassels and a wisp of dry silk peeking from the cob), show the kids how to pull the cob from the stalk. Tomatoes can be ripe whether they are green, yellow, orange or red - it just depends on the variety. Zucchini blossoms are picked first thing in the morning. Snap tender beans from the stem and pick these when the bean is slim and young for the best taste and texture. Get other gardeners, teachers, parents, and folks all ready growing gardens to officially join your school garden group. These people will be able to keep the garden active during the summer and school breaks. There should be one or two people committed to the garden's upkeep. Using too many rules or sign-up sheets leads to management nightmares and the restrictions make maintaining the gardening an unpleasant job. One solution is to have the individual caretakers enjoy the fruits and vegetables of their hard work (called an adopt-a-bed program). Nature dictates watering, harvesting, and caretaking needs. Gardeners need to be flexible and learn how to read "nature" and to act spontaneously. This is why assigning "Richard" to water every Wednesday would be a bad idea. 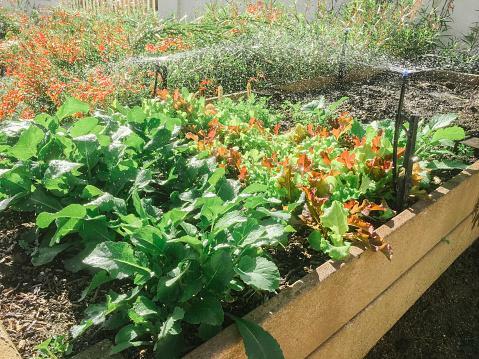 Harvesting and watering (if needed) is best accomplished in the morning. Never water in the evening as this can lead to fungal diseases. Always allow the weather and the plants' conditions to dictate what needs to be done. Are the beans looking pale? Add organic fertilizer. Too much of anything in a garden - compost, nutrients, water - are not good things. You may have to check with the school's security code - many states require individuals to be screened before going on the campus. 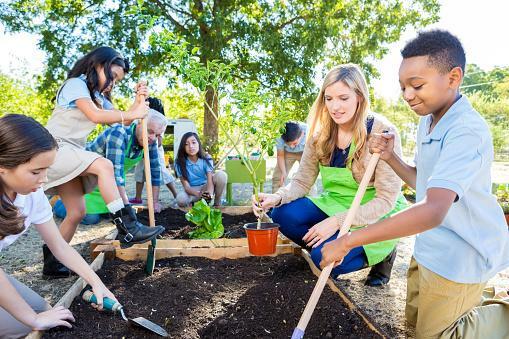 School gardens are perfect for any grade, and you only need one planting area to address the lesson plans relevant from kindergarten through high school. The lesson level and complexity changes, but the garden stays the same.